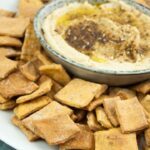 Recipe for vegan Pizza Crackers. Easy to make and they're the perfect snack for parties! They contain dried oregano, dried basil, and tomato paste that gives them a typical pizza flavor. Whisk together the water and tomato paste until the tomato paste has dissolved. In a mixing bowl, combine the flour, baking powder, salt, oregano, and basil. Then add in the tomato paste-water and olive oil. Stir to combine, then knead with your hands (or use a kitchen machine with a dough hook) until it's a smooth dough. Add more flour if your dough is too sticky. Cut it with a pizza cutter length- and widthwise. Carefully pull the parchment paper with the crackers onto a baking sheet. Bake the cracker in the oven for about 20 minutes (until they get crispy). Let them cool off a bit and enjoy!